Thanks for stopping by! NJOY declared bankruptcy in September 2016. As a result, I’m not recommending this brand presently. Are you a beginner? Take a look at the best e-cigarette for beginners. Experienced vaper? Look at all of the best e-cigarettes of 2016. Being available in many stores, NJOY has been one of the most familiar brands since the e-cigarette was first introduced in the United States. In fact, I very nearly became an NJOY customer when I first decided to switch to e-cigarettes three years ago because it was the only brand I had heard of. Back then, their starter kit cost over $100, plus another $30 or so for shipping — and it used cheap plastic disposable cartridges for e-liquid refills. How times have changed. NJOY now believes that the future of the e-cigarette industry is at the bottom end of the price spectrum and is working hard to get its new NJOY Kings disposables into as many stores as possible. Some crazy hype has surrounded the NJOY Kings since they were first announced last year, and in this review I intend to discuss whether they’re truly the right product to choose if you’re switching from cigarettes to e-cigarettes. View the NJOY King at the NJOY website. It costs $29.95 for a pack of five, $104.99 for a pack of 20 or $479.99 for a pack of 100. All orders ship for free and satisfaction is guaranteed. Use the coupon code VAPE4LESS when checking out for a 30 percent discount on all items. Disposable e-cigarettes have been around for quite some time. Although they tend not to be as economical over the long term as rechargeable e-cigarettes — such as the one that I discuss in my article about the best e-cigarette for beginners — they do provide a low-cost way for someone to try e-cigarettes and see how they work without investing in a full starter kit. Generally, if you tried and liked a disposable e-cigarette, you’d then move up to a full starter kit. NJOY, however, is betting that the e-cigarette adoption rate would be better if smokers had an option that more closely resembled the usual cigarette usage pattern of using a product once and disposing of it. To this end, the NJOY King is extremely small — the smallest e-cigarette I’ve ever used, in fact — and light. It also comes in a little plastic case with a clicking hinge just like that of a Zippo lighter. It definitely makes a good first impression, although the extremely small size means that an NJOY King won’t last as long as most disposable e-cigarettes on the market; it’s unlikely to last much more than 100 puffs before you’ll need a new one. To counter this, each puff from the NJOY King contains up to a whopping 4.5 percent of nicotine. To contrast, many e-cigarette companies don’t offer any e-cigarettes or e-liquids stronger than 1.6 percent. The first thing you’ll notice if you try the NJOY King is that it isn’t much heavier than a real cigarette; pretty impressive for something made from plastic and containing a battery cell. The outer shell of the e-cigarette is a thin plastic material that gives a little when you press it between your fingers. It doesn’t feel like a real cigarette, but it’s probably closer than any e-cigarette I’ve tried before. It should give you about the same amount of usage as a pack of cigarettes — possibly a little less than that, given the small amount of nicotine liquid contained inside — and the flip-top plastic case makes for a great storage solution on the go. The NJOY King tastes pleasant enough. It also produces a bit less vapor than some other e-cigarettes, although that’s to be expected given the small size. The very high nicotine concentration does compensate for the slightly lower vapor production, however. Although I typically use a much larger vaporizer, I experienced no cravings while using the NJOY King full-time in preparation for this review. I would therefore think that the NJOY King would be an excellent first-time e-cigarette for anyone who currently smokes tobacco cigarettes. The NJOY King scores high marks for its great look and feel, its appealing size and good sense of nicotine satisfaction, although the flavor and amount of vapor produced aren’t spectacular. Is it something that can replace a full e-cigarette kit for everyday use, though? In the past, I would have said “definitely not.” However, as I update this review in 2015, NJOY has changed their structure quite a bit. While the NJOY King once cost a fairly expensive $8.99 per unit — more than a pack of cigarettes in most states — the price has since come down quite a bit. If you buy in bulk and use the coupon code given below, NJOY Kings can cost as little as $3.35 each. Even if you can’t afford to buy 100 at a time, the five-pack will still save you a bit of money compared to tobacco cigarettes. Overall, the NJOY King is certainly the best disposable e-cigarette on the market. Design elements such as the flip-top case and extremely light weight make switching from tobacco e-cigarettes to the NJOY King feel completely natural. In addition, NJOY’s recent price drops mean that the NJOY King costs significantly less per unit than a pack of cigarettes would in any of the 50 states. 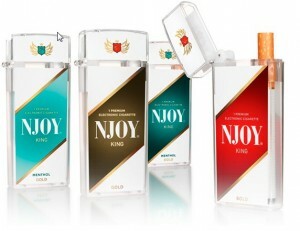 The NJOY King is a great introduction to e-cigarettes. You may even find that you never want to try anything else.